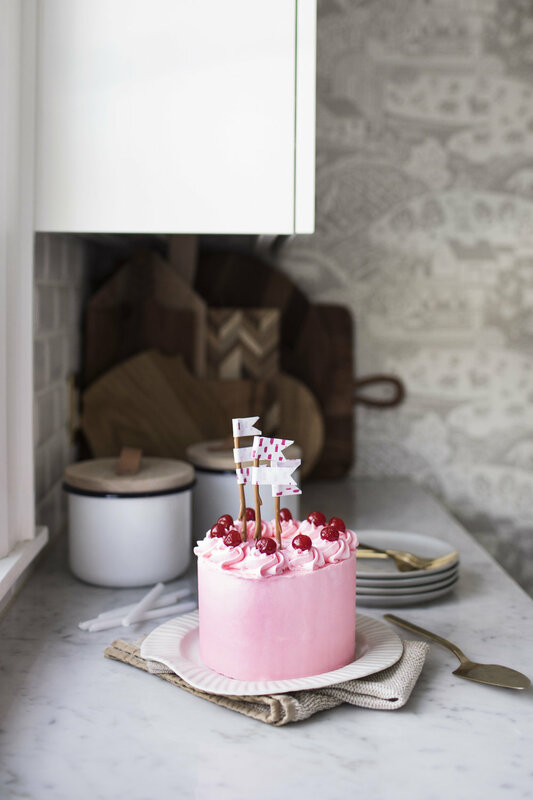 with valentine's day just around the corner, i can't think of a better occasion to bake up a pretty in pink cake. the colour of this cake is so vibrant & fun! this frosted layer cake is perfect to serve at any valentine's or galentine's party. i really wanted to create a valentine's themed dessert that didn't revolve around chocolate (don't worry, i'll be sharing a chocolate based dessert soon too), like many other valentine's recipes. while it is inspired by the classic boxed cherry chip cake, this homemade version does not compare. it is flavourful, moist & full of cherry goodness! 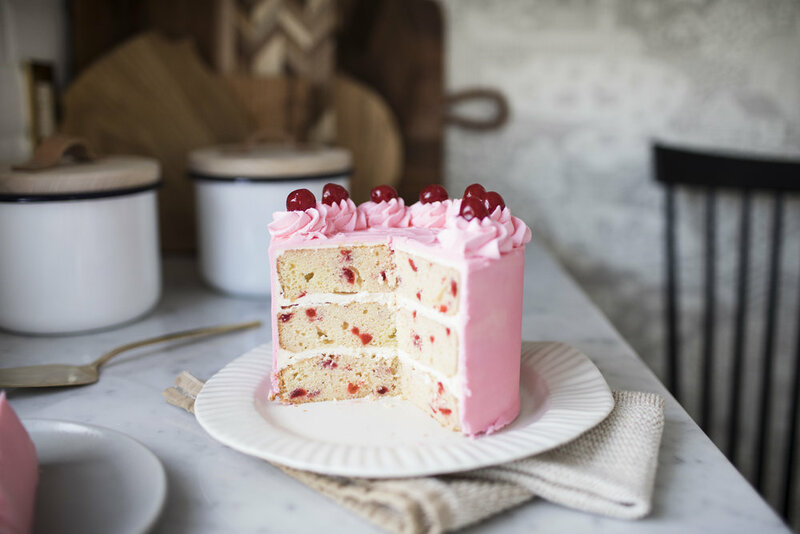 to get the ultimate cherry chip flavour, the cake features both maraschino cherries & lorann oil's cherry bakery emulsion. i used maraschino cherries as i prefer the distinctive flavour & vibrant red colour they bring to the filling, but feel free to try this recipe with fresh cherries too. 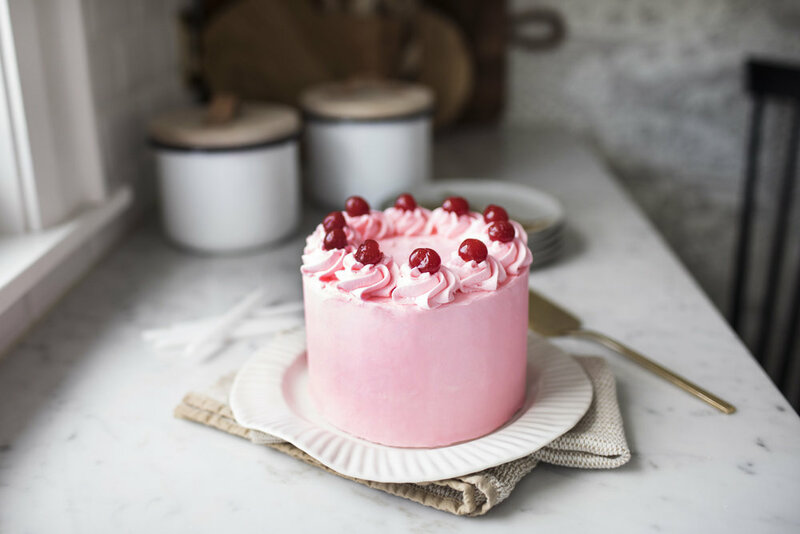 the cherry flavoured bakery emulsion gives the cake a luscious taste of fresh-picked cherries. the buttercream is flavoured with a splash of it too, so each layer is full of cherry goodness! for those who are not familiar with using emulsions instead of extracts, emulsions are water based instead of alcohol based which makes it much stronger then an extract once baked. lastly, my advice for obtaining a yellow cake with the maraschino cherry filling is to give the cherries a quick rinse before you chop them up! it removes any excess syrup that could cause a pink hue to the whole cake. 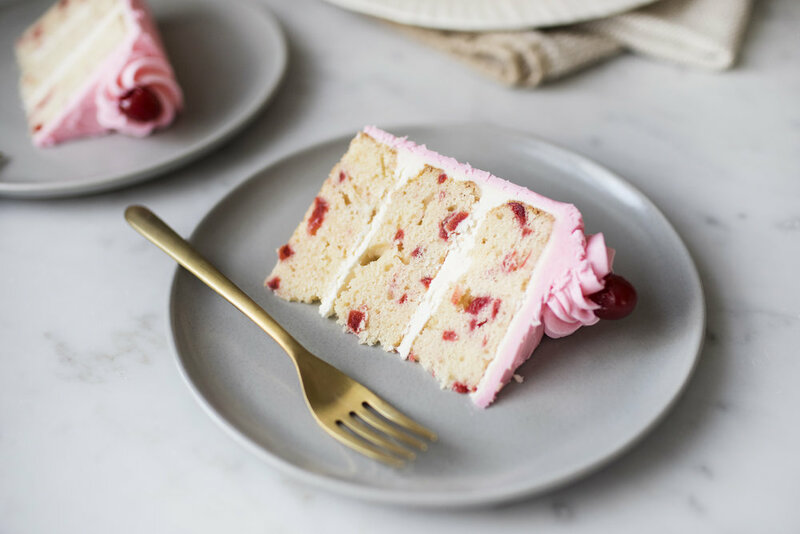 i think the contrast the frosting brings to the white cake is not only prettier, but more traditional to the original cherry chip cake we all love. preheat oven to 325 degrees. grease & line three 6-inch round cake pans. set aside until ready to use. add the vanilla extract, cherry emulsion & vegetable oil. beat until incorporated. in a separate bowl sift together the flour, baking powder & salt. alterante between adding the flour mixture & cream to the stand mixer bowl. beat until batter is smooth, about 2 minutes. evenly divide mixture amongst the prepared cake pans. bake for 20-25 minutes, or until the top bounces back to touch. in the bowl of a stand mixer fitted with the paddle attachment add the butter & sugar. cream until light & fluffy, about 10 minutes. add the vanilla, cherry eumlsion, whipping cream & food colouring. beat until the whipping cream is fully incorporated. frost cake as desired & top with maraschino cherries. this post was created in partnership with lorann oils! you can find the cherry bakery emulsion here.